This work aimed to study CD73 expression in chronic lymphocytic leukemia (CLL) patients and its correlation with other disease characteristics. CLL is a common B-lymphoproliferative disorder, which can be diagnosed in most cases by morphology and flowcytometry. It displays heterogeneity in clinical presentation, course, and response to treatment, which is likely due to the diversity of the biological nature of the disease. Diagnostic difficulty might arise in some patients due to atypical morphology and/or immunophenotype. CD73 is an extracellular enzyme that hydrolyses adenosine monophosphate to adenosine and is expressed on a subset of T and B lymphocytes. A number of studies have shown CD73 as a contributing factor in the multistep process of carcinogenesis by inducing favorable environment for tumor growth. However, it was shown in some studies to induce apoptosis. CD73 expression on both B and T lymphocytes was measured in 25 cases of newly diagnosed CLL and 15 healthy controls. The levels of expression were correlated to other disease characteristics. CD73 expression on CD19 + B lymphocytes was significantly lower in CLL patients compared with controls (mean 3.74 vs. 29.35%, respectively, P < 0.001). CD73 expression on T lymphocytes was also significantly lower in patients compared with controls (mean 0.46 vs. 5.10%, P < 0.001). CD73 expression on T lymphocytes was significantly lower in patients with Binet stage C compared with those with earlier stages (i.e., A and B) (mean 0.15 vs. 0.68, P = 0.05). There was no significant correlation between CD73 expression on clonal B cells and B-symptoms, clinical stage, lactate dehydrogenase, or β2microglobulin. CD73 expression is a potential diagnostic marker in CLL. This can be particularly relevant in cases with atypical immunophenotype using the current CLL scoring system. CD73 may have a role in CLL pathogenesis as low expression can lead to failure of termination of immune response with subsequent proliferation and clonal expansion of the involved clone. Chronic lymphocytic leukemia (CLL) is a common form of leukemia that accounts for 30% of adult leukemia . It is a malignant lymphoproliferative disorder of small, mature-looking monoclonal B-lymphocytes in peripheral blood, bone marrow, and lymph nodes . Recent data have demonstrated that not the entire leukemic cells are nonproliferating as some focal aggregates of proliferating cells are found in lymph nodes and bone marrow in what is called proliferation centers and they replenish CLL population by 2% each day . CLL shows significant diversity with regard to disease behavior. Patients are currently categorized into risk groups based on the clinical staging along with newer prognostic factors such as lymphocyte doubling time, serum markers, immunoglobulin heavy chain (IgH) mutational status is preferable mutational status, ZAP-70, and CD38 expression as well as cytogenetic abnormalities. Identification of different factors that contribute to the pathogenesis and/or allow more accurate determination of patients' risk group would be of most help in optimizing the management for individual patient . CD73 is a membrane-bound enzyme that catalyzes the extracellular conversion of adenosine monophosphate to adenosine. Adenosine is thought to play a role in promoting tumor growth and survival together with suppressing the host immune responses, which contribute to the multistep process of tumorigenesis. However, it was shown in some studies to induce apoptosis through caspase activation, which confers antitumor activity. Several studies have linked CD73 expression to different types of solid tumors . The aim of this work was to evaluate CD73 expression and its correlation with other disease characteristics in CLL patients. Twenty-five newly diagnosed CLL patients aged between 40 and 74 (mean 60.5 ± 7.3) years and 15 apparently healthy normal individuals aged between 52 and 69 (mean 59.0 ± 5.0) years were included in the study. Patients were recruited from the Oncology Institute, Menoufia University, during the period between September 2013 and November 2014. The study was approved by the local ethics committee and consent was obtained from involved participants. All patients were subjected to complete history taking, clinical examination, and laboratory investigations including CBC (Sysmex XN1000, Kobe, Japan), blood film, and measurement of lactate dehydrogenase (LDH) (Beckman AU480 Chemistry Analyser, Carlsbad, California, USA) and β2 microglobulin (Copas 6000 Analyzer; Roche Diagnostics, Indianapolis, Indiana, USA). 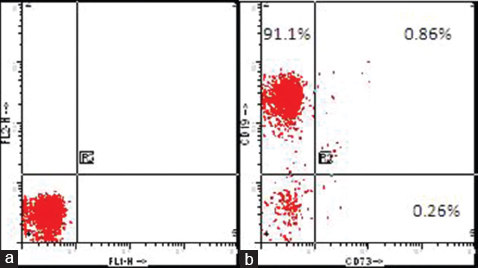 Flowcytometry using the standard CLL panel (CD19, CD5, surface Ig, CD22, CD23, FMC7) was carried out to confirm the diagnosis. Peripheral blood lymphocytes were separated with ficoll and washed three times using PBS, and then centrifugation was carried out for 5 min at 2000 rpm. Three tubes were prepared: with the first tube comprised 5 μm of FITC-conjugated antihuman CD73 and 10 μm of PE-conjugated antihuman CD19, and the second tube comprised 5 μm of mouse IgG1 K isotype control FITC (eBioscience, San Diego, California, USA). The third tube was used as negative control. The data were acquired and analyzed with a BD FACSCalibur flow cytometery San Jose, California, USA (BD Biosciences). The percentage of CD73+/CD19+ cells (B lymphocytes) and CD73+ cells (considered T lymphocytes due to gating of lymphocytes population) was evaluated. Samples were analyzed within 24 h of collection [Figure 1] and [Figure 2]. 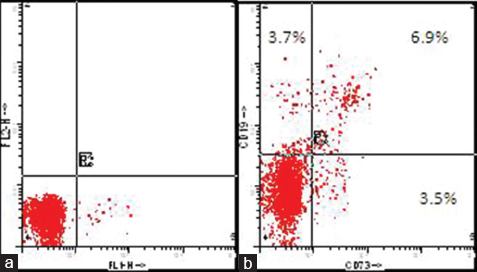 Figure 1: Quadrant histogram of chronic lymphocytic leukemia case showing (a) isotypic control, (b) CD73 expression of 0.26%, CD19 expression of 91.1%, and double expression of 0.86%. Figure 2: Quadrant histogram of normal control showing (a) isotypic control, (b) CD73 expression of 3.5%, CD19 expression of 3.7%, and double expression of 6.9%. Our study has shown that CD73 expression on CD19+ B lymphocytes was significantly lower in untreated CLL patients compared with controls (mean 3.74 vs. 29.35%, respectively, P < 0.001). Study of CD73 expression on T lymphocytes has also revealed significantly lower expression in patients compared with controls (mean of 0.46 and 5.10%, respectively, P < 0.001) [Table 1] and [Figure 3] and [Figure 4]. Figure 3: CD73 expression on B lymphocytes in patients and controls. Figure 4: CD73 expression on T lymphocytes in patients and controls. Patients with Binet stage C showed significantly lower CD73 expression by T lymphocytes compared with those with early-stage disease (i.e stages A and B) (mean 0.15 vs. 0.68, P = 0.05). 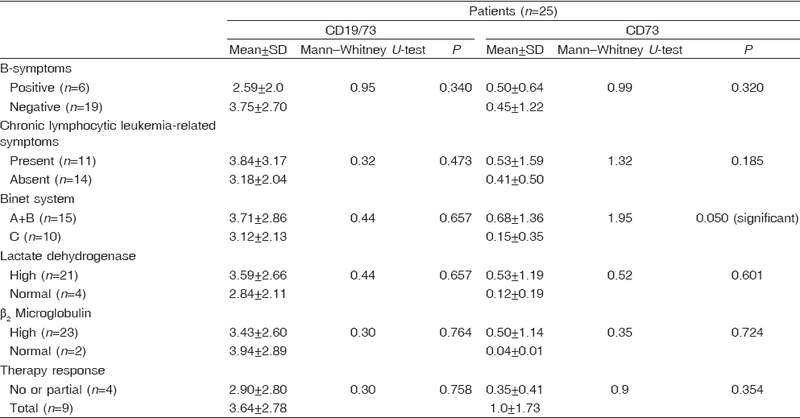 However, there was no correlation between the level of expression of CD73 on B cells and clinical stage [Figure 5]. 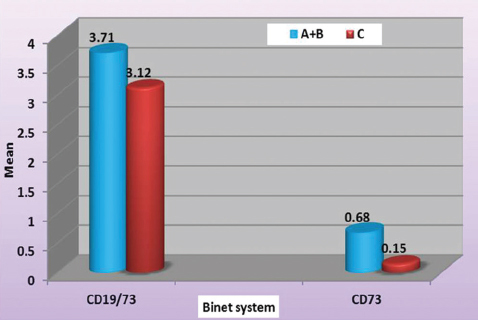 Figure 5: Correlation of CD73 expression on B and T lymphocytes with clinical stage. There was no significant correlation between CD73 expression on B or T lymphocytes and serum levels of LDH or β2 microglobulin (P > 0.05; [Table 2]). 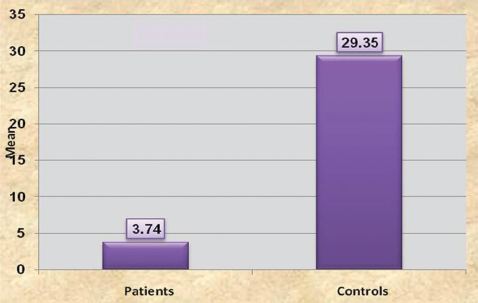 Among the 25 patients, 13 were evaluable for assessment of response to therapy. We did not find significant correlation between the level of CD73 expression and response to first-line treatment comprising six cycles of chemotherapy. However, the number of patients available for assessment of response was small, which makes it difficult to reach firm conclusion. Receiver operator characteristic curve showed CD 73/19 expression to have a sensitivity and specificity of 100% when 14.79% was used as a cutoff in our CLL patients. With more understanding of the molecular and biological mechanisms underlying the pathophysiology in CLL, there has been a remarkable change in the management of patients using risk-adapted approach, individualization of therapy, and targeting therapy . CD73 is a membrane-bound enzyme, which catalyzes the conversion of adenosine monophosphate to adenosine. It is thought to play a role in various types of cancer as adenosine exerts a cytoprotective activity of tumor cells mainly by facilitating immune escape and promoting cell proliferation and tumor angiogenesis. However, a role in induction of apoptosis was proposed as well. This work aimed to assess CD73 expression in CLL patients. CD73 expression was significantly lower on both clonal B lymphocytes and T lymphocytes, virtually, in all our patients. Similar results were reported by Pulte et al. , who found lower expression of CD73 on both clonal B cells and T cells in the majority of their CLL patients. 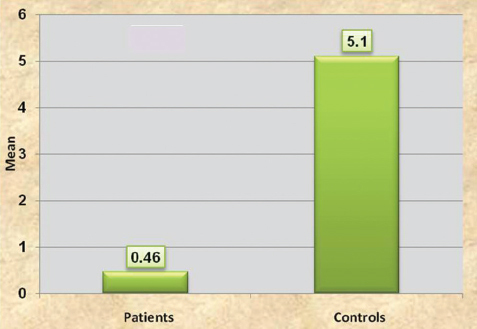 However, four out of the 34 patients involved in their study had high CD73 expression on their malignant clones. All four patients had Rai stage 1 disease, whereas none of our patients were in Binet stage 0 or 1 at diagnosis. Pulte et al. postulated that patients with CD73+ CLL have less aggressive course compared with CD73− CLL, which was associated with more advanced disease. Serra et al. tested CD73 expression in peripheral blood and in lymph nodes of CLL patients and identified CD73+ and CD73− CLL patients with approximately a third of the patients harboring CD73+/CD19+ populations. Those results were confirmed using RT-PCR, in which CD73 showed undetectable to low levels in approximately half of the patients. CD73 expression was significantly associated, in their study, with increased expression of the proliferation marker Ki-67 and ZAP-70; all are negative prognostic markers. Interestingly, CD73-generated adenosine was reported to inhibit migration of leukemic cells and thus is functionally involved in the regulation of CLL homing to the LN microenvironment, which keeps cells in a growth-favorable environment. This might explain, at least partially, the low CD73 expression in peripheral blood as only cells in low adenosine microenvironment can migrate . In addition, Rosi et al. used radioactive procedure coupled with HPLC and demonstrated significantly lower CD73 activity in B and T cell population in peripheral blood of CLL patients compared with controls in agreement with our results. We demonstrated significantly lower CD73 expression on T lymphocytes in patients with Binet stage C compared with those who had early-stage disease (A or B) at diagnosis. Similarly, Pulte et al. found a lower expression of CD73 on T lymphocyte in late-stage disease. However, high CD73 expression on CLL cells was associated, in other study, with more aggressive disease as it was associated with larger CLL clone and poor prognostic markers – namely, higher expression of Ki-67, CD38, and ZAP70 . We did not find significant correlation between response to chemotherapy and CD73 expression; however, the number was too small to draw any firm conclusion. Our study revealed no significant correlation between CD73 expression and the presence of B symptoms or other CLL-related symptoms at presentation or serum LDH and β2 microglobulin levels as well. Our study, among others, has shown low CD73 expression on both clonal B and T lymphocytes in CLL patients. Thus, CD73 is a potential diagnostic marker in CLL. This would be particularly relevant in cases with atypical immunophenotyping by standard panel. Low CD73 might be a contributing factor in the multistep process of tumorigenesis in CLL cases in which low adenosine can result in unnecessary prolonged stimulation of the immune system, normally switched off by adenosine, with subsequent clonal expansion. In addition, low adenosine might impair apoptosis. Hallek M, Pflug N. Chronic lymphocytic leukemia. Ann Oncol 2010; 21:vii154–vii164. Vyas N, Hassan A. Recent advances in chronic lymphocytic leukemia. Indian J Cancer 2012; 49:137–143. Gaidano G, Foà R, Dalla-Favera R. Molecular pathogenesis of chronic lymphocytic leukemia. J Clin Invest 2012; 122:3432–3438. Smolewski P, Witkowska M, Korycka-Wolowiec A. New insights into biology, prognostic factors and current therapeutic strategies in chronic lymphocytic leukemia. Hindawi ISRN Oncology 2013; 2013:1–7. Serra S, Horenstein A, Vaisitti T, Brusa D, Rossi D, Laurenti L, et al. CD73 generated extracellular adenosine in chronic lymphocytic leukemia creates local conditions counteracting drug induced cell death. Blood 2011; 118:6141–6152. Pulte D, Furman R, Broekman M, Drosopoulos JH, Ballard HS, Olson KE, et al. CD39 expression on T lymphocytes correlates with severity of disease in patients with chronic lymphocytic leukemia. Clin Lymphoma Myeloma Leuk 2011; 11:367–372. Rosi F, Tabucchi A, Carlucci F, Galieni P, Lauria F, Zanoni L, et al. 5'-Nucleotidase activity in lymphocytes from patients affected by B-cell chronic lymphocytic leukemia. Clin Biochem 1998; 31:269–272.